Saturday July 11 1908 I got the ironing done with Idas help and did cake baking and other cooking before noon. Nellie came out in the morning. We all went down on the 2.12 car Rob & Cora got home at 11.03 from Des Moines today It was very warm indeed. We did not come home till 5.39 then Nellie did not come with us. [Allie?] Holson is visiting there. I dressed the first young chicken tonight for dinner tomorrow. Will working in hay. Sunday July 12 1908 It was a very warm day. I got the dinner and Ida & I both slept in the afternoon We had expected to go to church in the evening but there was none at the M.E. church. 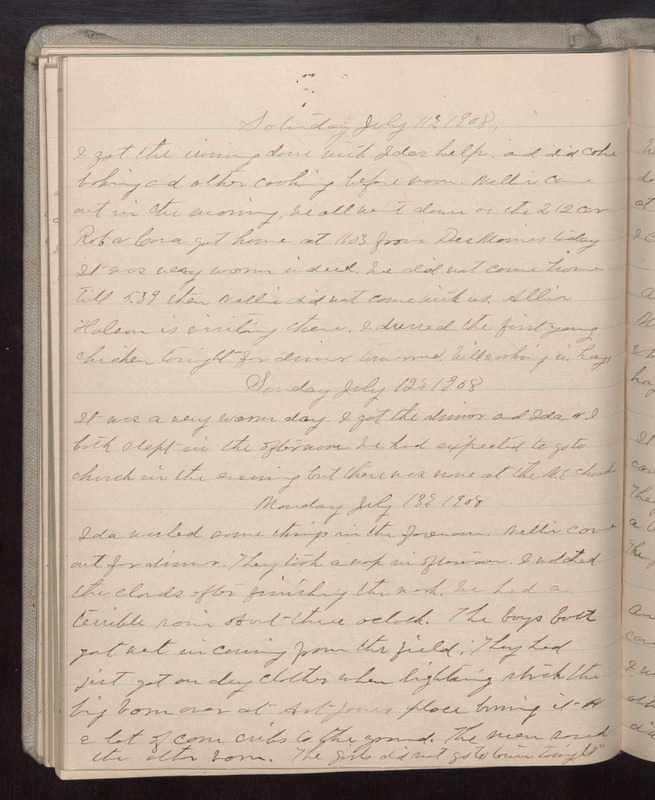 Monday July 13 1908 Ida washed some things in the forenoon. Nellie came out for dinner. They took a nap in afternoon. I notched the [illegible?] after finishing the work. The boys both got wet in coming from the field. They had jist got on dry clothes when lighting struck the big barn over at Art Jones place burning it & a lot of corn cribs to the ground. The men saved the other bard. The girls did not go to town tonight.